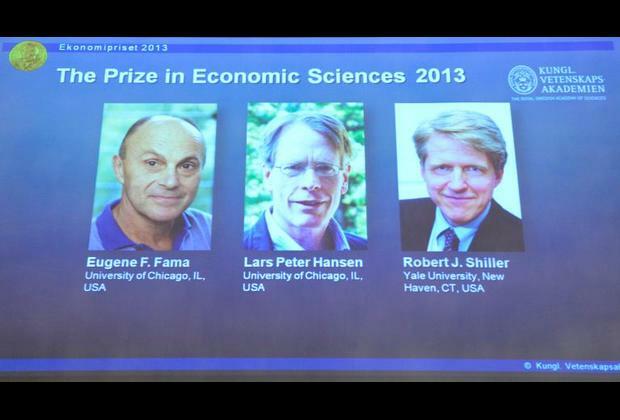 Winning a Nobel prize was no excuse for cancelling class for two economics professors who were feted by the University of Chicago Monday. Eugene Fama didn't even stick around for a champagne toast after a celebratory press conference attended by hundreds of faculty members and students. Fama, 74, was preparing for his portfolio theory class when he got the call from Stockholm that his work analyzing asset prices was being recognized. A couple hours later, the man colleagues described as a "phenomenal mentor" was teaching his students. When it was time to stand up in front of reporters, Fama attributed his success to the intellectual vigor of the university where he has spent the past 54 years. "I really value the fact that we have many points of view in the school and in finance," Fama said. "We argue vociferously, but it's never personal, and that's a very unique atmosphere." Asked if as a young economist he'd ever dreamed that he would become a Nobel Laureate, Fama laughed and said "as a young economist I thought about how am I going to feed my family." His fellow laureate Lars Hansen, 61, was affectionately called a "youngster" among the 88 Nobel Laureates affiliated with the University of Chicago. Hansen was about to walk his dog when he got the call and said he didn't quite believe it was real until an old friend on the Nobel committee got on the phone and "convinced me it was legit." He planned on spending the afternoon with some "very energetic" graduate students. Fama, Hansen and Yale economist Robert Shiller won the coveted award for groundbreaking work on spotting trends in markets. "This work has had important both in the theoretical sphere but -- unlike a lot of people in economics -- there's a lot of practical implications as well," said Gary Becker, a fellow University of Chicago economist who won a Nobel in 1992. The work has helped contribute to the development and success of index funds, Becker told AFP by proving that "it's very hard to do better than just buying the average of all stocks." "Most people do worse if they pick their own stocks and that's an important lesson to learn," Becker said. Fama's work began in the 1960's and found that stock prices are extremely difficult to predict in the short run, and that new information is very quickly incorporated into prices. "The world is a very uncertain place and you'd expect that to see it reflected in asset prices," Fama told reporters. "One of the criticism of efficient markets (theory) during the 2008 crisis is that volatility is very high... I thought that was a great experiment and it validated the theory." Hansen's work focuses on the connections between the macroeconomy and financial markets and testing theories of asset pricing using statistical models. "I wouldn't be a very good investment advisory," he told reporters as students crowded around hoping to snap a photo. "I'm very interested in how fundamental uncertainty influences markets and also people's actions -- when its it productive, when is it counterproductive," Hansen explained. Lately, he has been focused on how to design public policy such as the regulation of financial markets that is more transparent, less open to discretion and allows the private sector to respond "in ways that are productive." "The fact that we have a lack of knowledge or uncertainty means we have to be thinking a lot more about simple policies instead of much more complicated ones," Hansen said.